A funeral service to celebrate the life of the late Mrs June Gwendoline Burnside will be held at Lester & Son Chapel, 49 Thomas Mitchell Dr, Wodonga on Friday 8 June 2018 commencing at 2.00pm. Private Cremation. 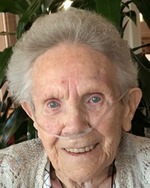 Passed away peacefully on 31 May 2018 at Wodonga, aged 88. Loving wife of Bill (dec). Loved mother, grandmother and great-grandmother of Susan, Gwenda and John and their families.